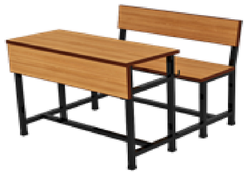 Without Shelf Double Desk with hook on both side for School Bag Hanging. Board SunMica, 25x25mm square pipe. 18 mm board total Frame black paint. 60 mm, 34mm, 27mm, OD MS Pipe, 40x40x4 angle & FRP chequered sheet. Six platefrom with canopy, wave slide frp, wide slide , tree climber spiral slide frp, see saw , two frp bridge, ,two frp tunnel , cargo net rock ladder, entry gate, acrylic ball. Abhi Creations is a foremost company involved in the production of excellent quality of school furniture and indoor and outdoor playground equipments along with a variety of play school furniture, kids school furniture that have found a wide market in the Indian subcontinent. Our aim is to develop and offer safe equipments for children that let them have fun while getting a little exercise. 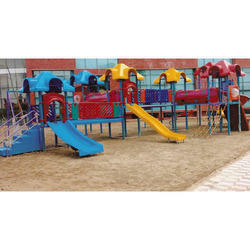 These playground equipments and furniture help the children develop their motor control in the process of getting all the action as well as frolic. We are greatly honored to be a member of the Toys Association of India, the apex body that unites the toy industry in India. We work in compliance to our goal of educating children in an entertaining manner. We offer safe as well as durable products that are widely sought after. 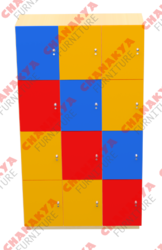 Our designer play school furniture are made of different materials like wood, galvanized steel and plastic and have been designed in bright colors and creative shapes that encourage children to learn in a fun-filled way. The use of safe and reliable raw materials also assures world-class quality and competitive sales prices of our product range. 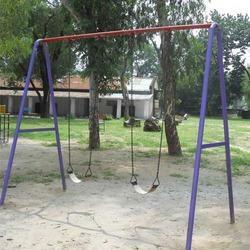 Our comprehensive range of school playground equipments includes a variety of items like toys, jumbo slides, merry-go-rounds, playground swings, soft play equipments and playschool furniture of various kinds includes Kindergarten Furniture, Classroom Furniture, School Tables and Chairs,Library Furniture, Lab Furnitures,Math lab,Computer lab, Playgrounds and Theme furniture.The play school furniture and kids school furniture meet the recreational demands of Play schools,shopping malls, residential areas, parks, kindergartens, restaurants and other family entertainment centers. We have today reached a leading position in the industry owing to our innovative designs and stimulating products range.